I will be the first to admit, I am sometimes a forgetful person. Forgetful as in I often misplace things. The motto in our house is "M.T.A. ", which simply stands for "move things around". Can't find something? Move some things around and it magically reappears. While the majority of things that I "misplace" can be easily replaced, like an article of clothing, one thing that I would never forgive myself if I lost would be my engagement ring. To lose something that has so much meaning, and that Steve poured his hard earned money into, would be heart breaking. Which is why, purchasing ring insurance days after getting engaged was a no brainer. Is it for me?Yes! Like a house or vehicle, it is important to have appropriate coverage in case of theft or damage. A good policy will cover every potential ring situation from theft, to damage and even dropping it down the sink. How do I get it?There are a few ways to insure your engagement ring. Firstly, ring insurance can be purchased as an extension (or "rider") of your renter or homeowner policy. In the case that you don't have renter or homeowner insurance, a policy can be purchased on its own, often called a personal articles policy. Personal articles policies can be purchased through companies that specialize in jewellery insurance or through your own home and vehicle insurance company (i.e. State Farm). 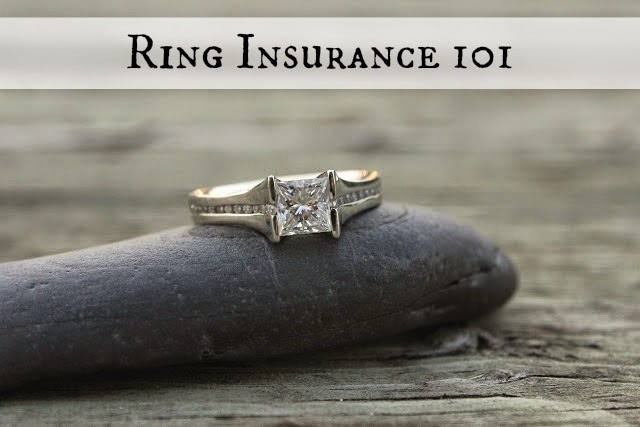 How much does it cost?The yearly cost to insure your ring is insignificant compared to its original value, only about $1-2 for every $100 it would cost to replace. Obviously the cost of the premium also depends on other factors such as the value of your ring, your deductible and even where you live. For most people, you're looking between $100 and $200 a year. Spread over 12 months, that's peanuts compared to its monetary and sentimental value. How does it work?When purchasing ring insurance, you will need to provide a receipt for the ring, as well as an appraisal. Since the value of diamond, gold and platinum are always changing, you will need to get your ring reappraised every 2 to 3 years. Chances are the ring has increased in value since it was purchased. If lost or stole, insurance companies will only replace the value they have on file, so if you don't have a recent appraisal you could be losing out. Other tips?Make sure to keep your insurance papers and appraisal information in a secure location, such as a safe. When you're not wearing your ring, make sure it has a safe home as well. Chances are the insurance company will do it for you, but you may also want to take photos of the ring for your own records. And lastly, if you move or change your last name, make sure the policy follows you and your information is current. If anything, a ring policy will give you peace of mind, and make your husband happy knowing his investment is protected. Thank you this is so helpful I need to insure my ring but had no idea how to do it! I have insurance on my ring. It's clutch. I have a pearl ring, and the ring has fallen off 3 times. I have ring insurance and would never go without it. I damaged my engagement ring recently and as heartbreaking an experience as it was, at least I had the insurance to help. You're right, it certainly gives you peace of mind.